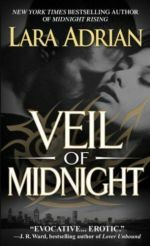 I like this series and Veil of Midnight is probably my favorite novel in this series so far. It was only near the end that I thought the story faltered (a bit). Interestingly enough, for a romance novel, I thought the action and suspense part better developed. There are quite a few twists and turns, and in the beginning, it doesn’t look all that good for Nikolai and Renata. I liked this “edginess.” By comparison, the romance seemed a bit underdeveloped. Nikolai and Renata appeared to be in love mainly because of a vision and some blood drinking. I think the new development (Hunter) interesting and I’m looking forward to reading Andreas’s story, Ashes of Midnight. Oh, how could I forget how much fun this series is? Really, I think this series funny, tongue-in-cheek, and clever at the same time. My favorite part in this novel: the heroine, Sabine. She has the best lines and just cracked me up. I loved her character and her unapologetic behavior, and really, she has a point: she was raised to value different things. I liked this clash between “good” and “evil” and how sometimes “evil” can be just what is needed. I loved Rydstrom’s bafflement and bewilderment about Sabine and how his world and his priorities got turned upside down by her. And I really like that the world in this series is so “alive” – stories seem to be everywhere but they don’t necessarily are sequel bait. Kiss of a Demon King is one of my favorite entries in this series. 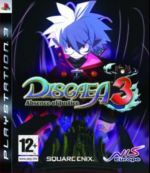 When does the next one in this series come out again? Verdict: I really liked it (4,5/5). Desire Unchained is a novel full of interesting ideas and it’s an action-packed novel. It’s fast-paced and because there’s a lot going on, sometimes it seemed too busy as in all the interesting ideas didn’t get played to their fullest because the next thing was just around the corner. While this isn’t necessarily bad, more like a matter of taste, there’s one thing I thought the lack of time/pages mattered: Shade’s “special gift.” To me, it appeared to be there more to up the kink than really integrated well into the story. Runa and Shade face near unsurmountable odds and there’s a lot of high and low in their relationship. Overall, Runa and Shade make a well matched couple. Gem’s and Kynan’s story continues in Desire Unchained and they have a scene that nearly had me teary-eyed. I liked the darkness in this novel, the glimpses of other characters, Wraith especially, and I thought the three brothers had a nice dynamic to their relationship. I’m looking forward to reading Passion Unleashed. Lara Adrian – "Midnight Rising"
“Fueled by pain and rage over a shattering betrayal, the warrior Rio has pledged his life to the war against the Rogues. He will let nothing stand in his way – least of all a mortal woman with the power to expose the entire vampire race. But now an ancient evil has been awakened, and a stunning darkness is on the rise. 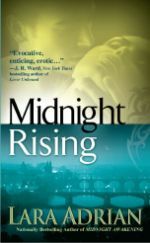 Midnight Rising is a tightly plotted and fast paced story. There were only two small things that made me go “huh?” but aside from that I enjoyed reading this novel. After discovering that an Ancient is still alive in Midnight Awakening and missing, in Midnight Rising the Breed warriors are hard at work searching for him. 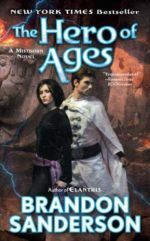 There are two short scenes where the reader learns more about what’s going on with the Ancient; knowledge the warriors have only at the end of Midnight Rising. What struck me with these scenes is the question they raise: clearly the Ancient is evil but what about his captors and the way they treat him? I liked Dylan, the heroine. She’s described as a smart person and thankfully she acts like it. I trust her to count 1 + 1 together and not arrive at 3,173. I also liked Rio. Despite his treatment of Dylan at the beginning (see next paragraph), I see him as a honourable person. Although he’s determined to end his life, he owns up to the mess he made (let Dylan discover the tomb because he didn’t blow it up right away) and doesn’t just leave and let the other warriors deal with it. The beginning of the romance in this novel is not an easy one. Right away, it has one point against it because it begins with the abduction of the heroine by the hero. As a captive romance it relies heavily on the readers willingness to belief that a captive can fall in love with the abductor. The captive plot doesn’t last for the whole novel, although it’s difficult to say when it really ends. After Rio discovers that Dylan is a Breedmate (really hate that word), his behaviour changes even though he can’t let her go right away. Apart from the captive plot line, the credibility of the romance is made even more difficult because – and that’s what I count as a second point – the whole story lasts just a few days (7 days with the last chapter one week later). Adrian goes to some lengths to make the reader believe in the romance despite these two points against it. There are some touching scenes between Dylan and Rio, most notable probable when it’s about Dylan’s role in Rio’s life. It worked like a “up the OMG-factor to make the reader not think about the plausibility of falling in love with your abductor in just a few days” device for me. One thing that surprised me a bit later in the story I see as compensation for Rio taking Dylan captive at the beginning. Of course, this also makes it possible for the climax to happen the way it does and takes care of the couple’s way to their HEA, so viewed cynically, the compensative effect is just an added benefit of the external plot’s progress. But it accomplishes three different things with one move, and that’s not bad. I also had the impression that the ghost of Rio’s ex-wife, Eva, helped to reduce the problems with the credibility of the romance. It’s again a three-for-one deal, in that it’s also tied to Dylan’s gift (each Breedmate has a special gift) and the external plot. So, on the question of the credibility of the romance, I think Adrian did a good job with it despite two points against it. If I can swallow that someone falls in love in a total and complete, this-is-forever kind of way with another person 1.) in the course of a few days and 2.) when this other person is something the someone didn’t even know existed before meeting, then I can suspend the rest of my disbelief to go the whole way and believe this can happen when the someone was taken captive by the other person at first. At least, when I have the impression – like I did with this novel – that the author is aware of the problems. Of course, more time would have helped the romance but it would also have slowed down the external plot and maybe weakened it there instead (which is probably what made me enjoy Midnight Awakening less). Funny thing I noticed when I read the abduction scene again for this post: when it’s 5 a.m. in Boston, it’s 11 a.m. (= already day time) in Berlin, not the other way round. Do all the novels in this series have to end the same way? WHY THIS NOVEL: Part 3 of a series. “With a dagger in her hand and vengeance on her mind, Darkhaven beauty Elise Chase prowls Boston’s streets in search of retribution against the Rogue vampires who took from her everything she cherished. Using an extraordinary psychic gift, she tracks her prey, well aware that the power she possesses is destroying her. She must learn to harness this gift, and for that she can turn to only one man – the deadliest of the Breed warriors, Tegan. 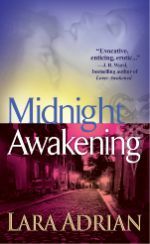 Compared to the other novels in this series, Midnight Awakening got the most positive comments as far as I know. What I don’t know is if it is because of these comments my experiences were too high or something else, but Midnight Awakening didn’t “wow” me the way I expected. minor ones: the custom to be naked when taking blood from a partner. I didn’t pick up on this in the novels before so I thought it a convenient way to get Tegan and Elise naked together early. Also, Tegan recovers really fast from being tortured and thinking he turned Rogue (did he or didn’t he?). Elisa and Tegan go to Berlin to follow the trail of an old journal that the villain wanted to get his hands on. The only remaining vampire connected with this journal is currently being held in a facility because he turned Rogue (it’s thought he may be brought back). Elise meets the Breedmate of this Rogue and they talk. And now the coincidences start. One day later, this woman calls to say she found some letters which belonged to her brother-in-law, turned Rogue several years before her mate. She went through his things to put them away. Why does she do this now? After her mate turned Rogue, she left the Darkhaven and lived among humans. And she took things of her brother-in-law with her? Into a, I assume, smaller flat? Elise and Tegan are looking for a minion all over Berlin. I think it’s right the next day that this minion turns up at a club that belongs to someone with close connections to Elise’s and Tegan’s contact in Berlin. What’s more, it’s a club the minion only visited a few times in the past and it’s also a club he got banned a couple of months ago. Why does he go there again? Other than for plot reasons, I mean. As I said, Elise and Tegan are in Berlin to get some information about a journal. They talk with the Rogue held at a facility and he says one thing which is not just crazy rambling. He talks about a “he.” Elise and Tegan (and later the other vampires of the Order) can only guess at the identity of this “he” but I was fairly sure about it. So the suspense of that question didn’t really work for me. And what’s the deal with Elise’s talent? Can she hear only nasty thoughts? Or do only nasty thought cause her pain? Do only humans, minions, and Rogues have nasty thoughts but never Breed vampires and Breedmates? Or is it that Breed vampires and Breedmates shield their thoughts all the time or is it just that Elise can’t read their thoughts or what? My thought about this: nasty. One more (small) thing about why this novel didn’t work like I had expected: the meeting between Lucan and his brother was rather anti-climactic. After reading the other two novels I expected something more. I liked Elise. She’s a refreshingly active heroine. For much of the story her actions are fuelled by revenge for the death of her son. She does everything to accomplish that. Sadly, she seemed a bit de-fanged at the end. Tegan is the loner, a I-don’t-do-feelings hero. And he’s got this act down pretty well. There are some nice confrontations between him and Elise, especially in the first half of the story when Elise needs Tegan’s help and he doesn’t know what to do with his unwanted feelings. They have things in common and this makes it understandable why Elise is able to touch Tegan emotionally. The steps of their falling for each other seem true although that this happens in such a short amount of time is something that always strikes me as unbelievable (mostly after I finish reading and realize the story took place no longer than one week). I also liked the change of place which makes Adrian’s world bigger than just one city. A twist at the end puts Tegan in the role of his former mate (abducted and tortured) and I thought this could be interesting in terms of Tegan’s character development. The element was there but it wasn’t really followed up in the story. And that’s something I thought a couple of times while reading this novel: things are touched upon / indicated but for me, there’s missing something (more). Like when Lucan and his brother finally meet or Elise’s brother-in-law who’s nearly absent compared to what I thought he would get to/need to be part of Elise’s and Tegan’s story. Or just look at my “too obvious plot coincidences” – a bit more explaining and I’m sure they could have worked for me. I know that’s probably a question of page count but that doesn’t help my feeling that some parts were missing in Midnight Awakening. Would I read this novel again? Yes (as part of series). 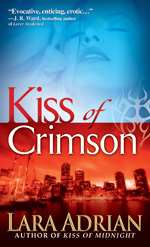 Lara Adrian – "Kiss Of Crimson"
“He comes to her more dead than alive, a towering black-clad stranger riddled with bullets and rapidly losing blood. As she struggles to save him, veterinarian Tess Culver is unaware that the man calling himself Dante is no man at all, but one of the Breed, vampire warriors engaged in a desperate battle. In a single erotically charged moment Tess is plunged into his world – a shifting, shadowed place where bands of Rogue vampires stalk the night, cutting a swath of terror. I liked the first one in this series so it was only a question of time when I would get this one. I’m happy to say that I liked this one as well. Much of what I said about the first one is true for this also. I liked its “gritty-ness.” I like that Adrian has a firm grasp on the story at hand and that she stays on it throughout the novel. From the premise of the series, you know there will be sequels but there is no sequel-baiting going on. When Adrian leaves the main story it’s for a good and relevant reason (not like an other author many know). The focus of this story is both on the events and the romance, maybe diminishing the romance a bit (from a romance novel point of view). On the other hand, this was something I enjoyed very much because often in a romance novel the external conflict is rather flimsy and more an annoyance than an addition. I didn’t think that here. There was a small “Huh?”-moment with the heroine’s characterization and I didn’t quite get why the hero kept the heroine’s breedmate status secret so long, but other than that I found both hero and heroine convincing. That they had the same kind of problems (“running away”) helped in understanding their connection despite the short time frame of the story. Generally, I like that there are shades of gray in characters and that Adrian doesn’t shy away from writing the un-pretty.